Redesigning of Tgcom24’s website, one of the most important News Channels in Italy. Revamping the website was about adding new graphics to give more clarity, symmetry and style to the news sections. We focused on making the experience easier, keeping a strong eye on the users’ need. In this regard, we also added the “Read Later” option, the ability to select the preferred content and to save it, in order to read it in a different time. 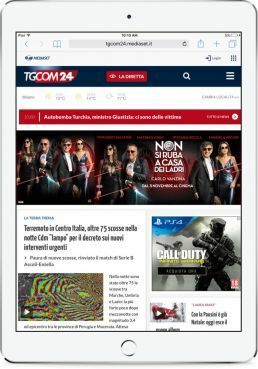 TGcom24 has now a fully responsive website, which can be read and navigated on all the different devices with a unique customer experience.